Today, August 17, the National Flag Day is celebrated, so Bolivians will pay homage to the tricolor that made its first appearance in 1825, as the only Bolivian emblem. At present, it is formed by three horizontal stripes of equal width and dimensions, with the colors red, yellow and green. 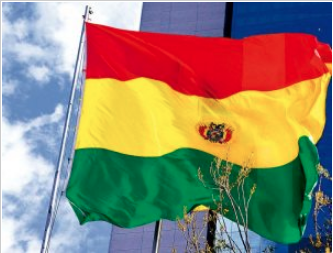 Today, August 17, the National Flag Day is celebrated, so the institutions will pay homage to the tricolor that made its first appearance in 1825, when the first Bolivian emblem was created. At present, it is formed by three horizontal stripes of equal width and dimensions, with the colors red, yellow and green. On August 17, 1825, the Deliberative Assembly, created by decree, the first flag, consisting of two green stripes at the ends, upper and lower, and a red, wider than the green, to the center. At the center of the red strip, five medium green ovals formed by olive and laurel branches were placed, one in the middle and four on the sides, and inside each of these ovals, a gold colored star was placed. In this way, the first National Flag, expressed the content of the Republic, in its three kingdoms of nature. On July 25, 1826, the flag was modified, the green of the upper part was changed to yellow, followed by red in the center and green below. Instead of the five golden stars, the arms of the Republic at the center surrounded by two branches of olive and laurel. Finally, on November 30, 1851, at the request of President Belzu, the National Convention, he definitively reformed the Bolivian flag, with colors, red on the top, yellow on the center and green on the bottom. That is how the formation of our beautiful and unparalleled homeland flag was left.